This is a great postcard. Hope your holiday back in the UK wasn't too wet - weather has not been too kind to use this past week. This is SO cool! 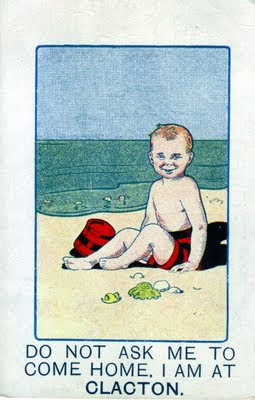 I adore this postcard. lol I hope you had a wonderful holiday. Such a beautifully designed card, what a find. Hope you enjoyed your holiday. That is a wonderful image. Thanks so much for sharing, but now I want to go to the beach. Great card. I posted a beach card too but it's very different. Happy Friday, what's left of it!